Thanks for the write up! I doubt I would ever do this, but it’s interesting nonetheless! Kaley [Y Mucho Más] recently posted..What’s With all the Al- Words in Spanish? It was one of those, ‘well, why not?’ moments when I booked the flight! It was fun, but I probably wouldn’t do it again. Did you go to the Toro festival this year? I saw it on the news and thought of you. They use tomatoes from Extremadura because they’re rotten/overripe, right? You’re right – the tomatoes can’t be used because they are bruised or overripe, so they get thrown instead. THAT is why I stunk so much after the event! Ah, come on Cat, I want to go with you next year! It has always been on my bucket list, I just haven’t gotten around to it yet. I’m going to keep this blog as it seems to have seriously good advice for when I do, thanks. See you in October, besos. Looking forward to it – I’ve got something for you! Enjoy the beach while you can. I’ve always been on the fence about whether I’d actually want to do this. But it sounded like it was a lot of fun! 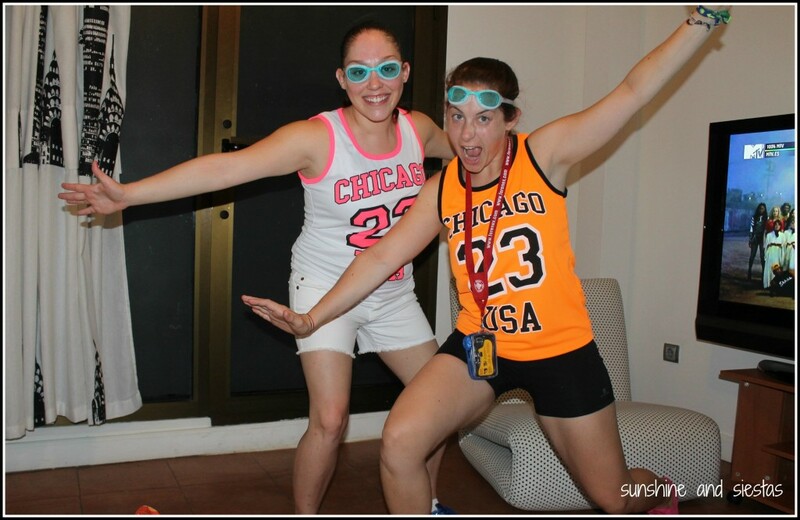 Loving the goggles. I always was, too, but when the moment is right…! Haha that looks so much fun! 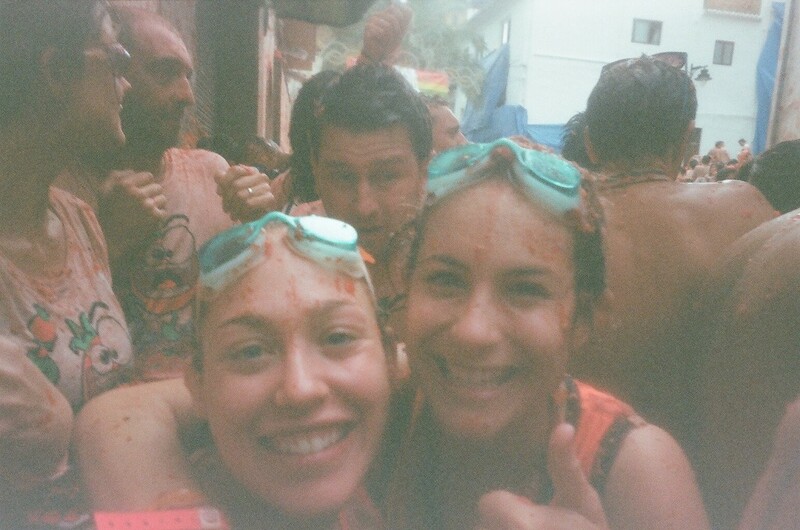 I’ve wanted to go to the Tomatina for the past 2 years but I haven’t been able to either year. Hopefully your tips will come in handy next year! It was fun…you’re close, so no more excuses! Have to rep your hometown! 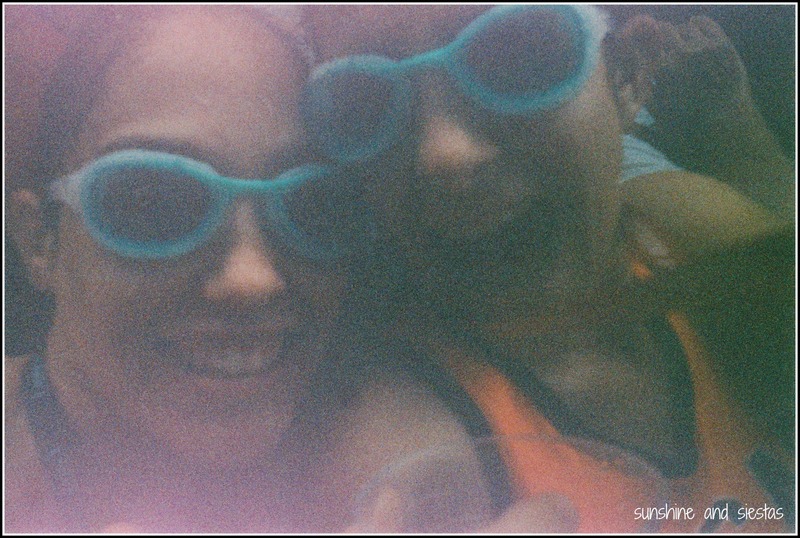 lol at the goggles. I don’t think I’m fun enough for these kinds of festivals. 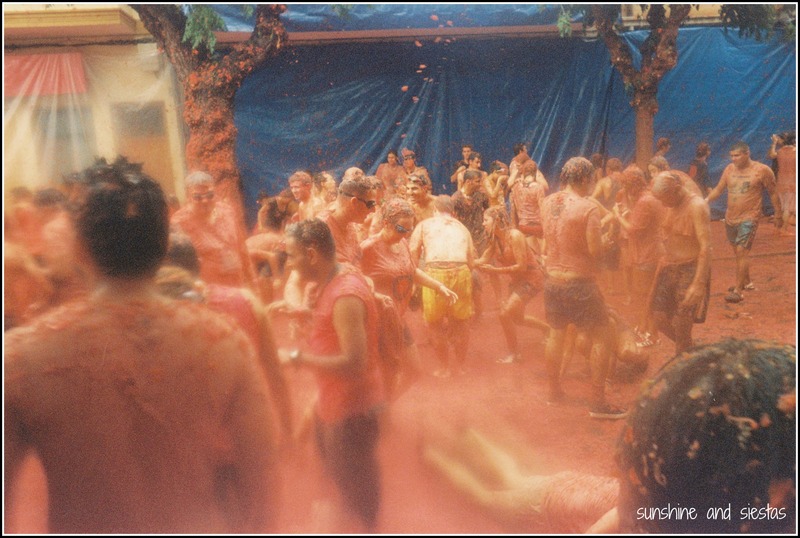 Ive been in Thailand during Songkran but I’m not a bit fan of chaotic and messy! It’s not a festival I want to go back to, honestly. Oktoberfest, yes. 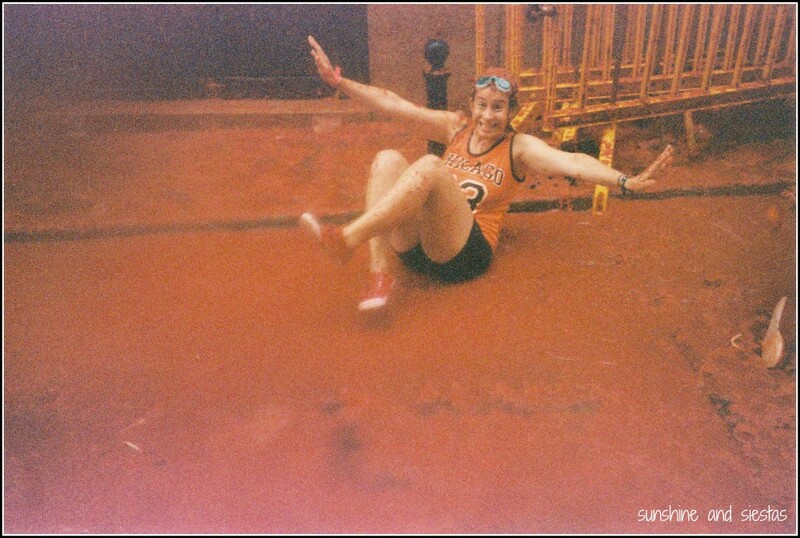 But the Tomatina was one of those things that kind of happened and I rolled with it! Now you got me thinking about tomato ice cream. I’ve had mushroom and lobster ice cream so I think tomato ice cream would probably be pretty good! It wasn’t bad at all! Would be great at a stuffy restaurant as a palate cleanser. I love that you did a Decathalon run for this. We discovered Decathalon when we were in Spain, and I’m still missing it. Sigh. Such great deals. I saw loads of kids, so I would definitely take them! Who doesn’t love a food fight?! Part of me thinks that looks like fun, while the other part of me thinks I’d hate it! The pinkish photos are a hoot! Yes, I still feel that way about it. I had fun, I threw some rotten fruit, and then I went home smelling. Not keen on doing it again, though! I’ve always been fascinated by this festival but have never been, so love seeing these photos and hearing your account! 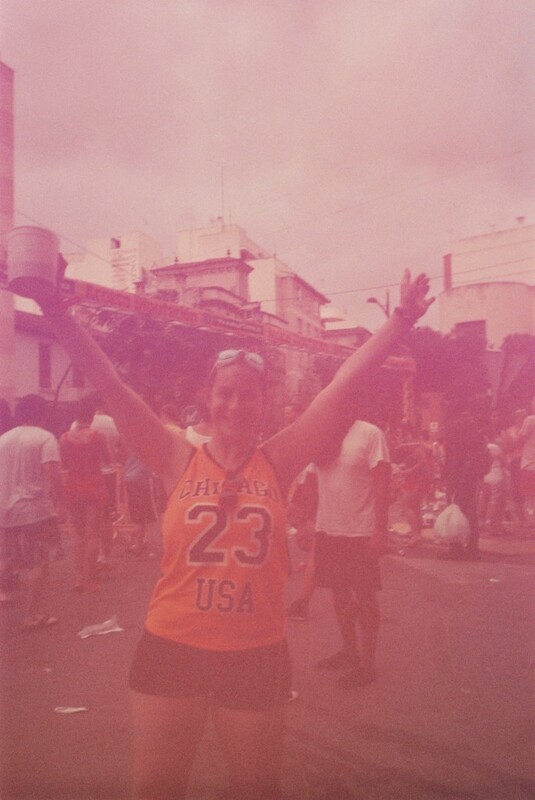 It’s funny how it resonates with an American’s image of Spanish fiestas! Wow — what an amazing experience. But will you ever want to eat spaghetti with tomato sauce again? I had NO problems eating more tomatoes! It’s one of my favorite foods. How much I want to go there. Just curious do small kids participate around 4 years old? 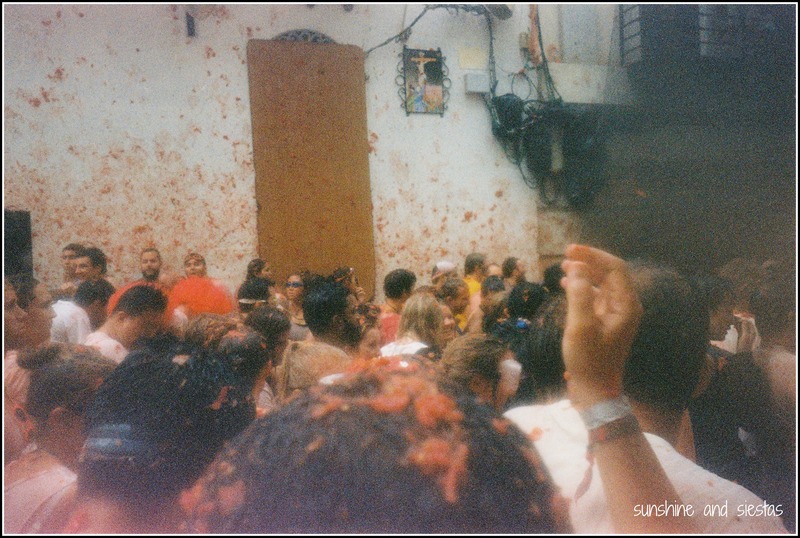 Thanks for the great insight into the the Tomatina Festival. I always wondered what it was all about. I’m relieved to learn that the tomatoes can not be eaten. I hate the thought of wasting food. Oh, Mary, if you smelled the tomatoes, you definitely wouldn’t eat them! I reeked of rotten veggies for a while! Wow!!! That thing might be crazy!!! I have never been there, but it has to be an incredible experience. I’ve been told though, that people there are most from overseas visiting the country. Is that correct?? Are there Spaniards too enjoying the party?? You’re right – most of those visiting are foreigners, but there were some Spaniards, as well! We mostly saw Japanese and Australians, and quite a few other Americans, too! Eeh, I wouldn’t take young kids to the Tomatina – too many people in a small area, and even as a woman of normal stature I felt cramped! I just watched a TV show that mentioned there’s a kid-friendly version of the festival with pre-squeezed tomatoes! Would be worth looking into. Hi Tracey, I don’t know off hand but you could always try Valencia’s official tourism site! Good luck and have a great time! Thanks for the direction. I will give that one a try.